Darren Bravo is a West Indies cricketer, who is known for his distinct batting style that resembles that of all-time legend Brian Lara. He was born on 6th February 1989 at Santa Cruz in Trinidad and Tobago. He bats left-handed but bowls right-arm medium pace. 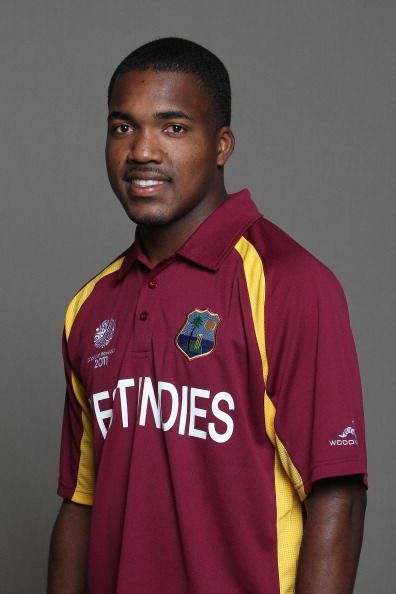 He is the younger half-brother of Dwayne Bravo and the first cousin of cricketing legend Brian Lara. An extremely talented batsman with generous amounts of potential and a fine temperament, his only fault has been living in the shadows of The Prince - Brian Lara. With the same batting style and mannerisms, came the burden of performing equally well. While his career has not exactly been identical to Lara’s, if his style is stopped from drawing comparisons he has had a fantastic career on his own right. After impressive performances for the Under-19 team of Trinidad and Tobago, he was promoted to the senior team making his first team debut in January 2007, while making his first-class debut three days later. After failing to grab the opportunity he was sent back to the Under-19 team, playing just one more game for the senior team. He shone again as he finished the TCL Under-19 Challenge with the most runs by a batsman scoring 419 runs at an average of 59.85. He was part of the West Indies campaign in the 2008 Under-19 World Cup in Malaysia. He played all of the five games, scoring 165 runs. His performance in the Plate Final against Nepal was splendid as he took three wickets and scored 24 runs to guide his team to victory. An outstanding performance in domestic circuit with Trinidad and Tobago, saw him called up for India’s tour of the Caribbeans in July 2009. He made his ODI debut on 26th June 2009, in the first match of the series. He had a very modest debut as he scored 19 off 16 balls as West Indies lost the match by 20 runs. He had similar unassuming performances in the following matches. His Test debut was comparatively better as he scored a decent 58 against Sri Lanka. He made his debut on 15th November 2010 as Gayle took Galle by a storm, scoring a mammoth 333. He managed to maintain his form in Tests and finished the series against Sri Lanka with an average of 68.66 from three matches. He shot to fame in the final match of the two Test series against Bangladesh just after the 2011 ICC Cricket World Cup campaign. After a dismal show in the first match which was drawn, he scored his maiden Test century to help West Indies secure the series. He almost scored a double century but was caught out on 195. He got his due double century two years later against New Zealand on December 2013, as he rescued his side from a humiliating defeat to draw the match. He scored a splendid 218, staying on the pitch for almost 10 hours. He was particularly impressive against Australia in 2015-16, in the three Test match series. It was a poor show from the Windies squad and Bravo’s exploits of 108 and 81 in the first and second test respectively could not help them from losing both the matches. In 2016, he put up a great knock of 102 to help West Indies win a tricky tie against South Africa in the 9th ODI match of the Tri-Nation Series. Bravo was involved in a spat with former West Indies Cricket Board President Dave Cameron in 2016-2017. Poor performances and a consequential dip in form did not help the situation at all, as he was dropped from the national squad. However, after mutual apology from both WICB and Bravo cooled the matters down and Cameron himself revealed that there was a chance Bravo could make a comeback. He is highly regarded as a T20 specialist despite having more success in longer formats of the game. He has represented Trinidad and Tobago, Kolkata Knight Riders, Trinbago Knight Riders, Nottinghamshire, Comilla Victorians and Multan Sultans in the domestic circuit. He is the first batsman in history to score a test century in the fourth innings of a Day/Night test match. He also the first left handed batsman to score a test hundred in a D/N match. Bravo along with Denesh Ramdin set the record for the highest third wicket partnership in ODI history (258).